Hypocrisy so thick you literally have to shovel it out of Congress. Remember when the Dems claimed the Republicans shut down the government in 2013 and how they were evil obstructionists? Well, they don’t seem to have a problem with that now. 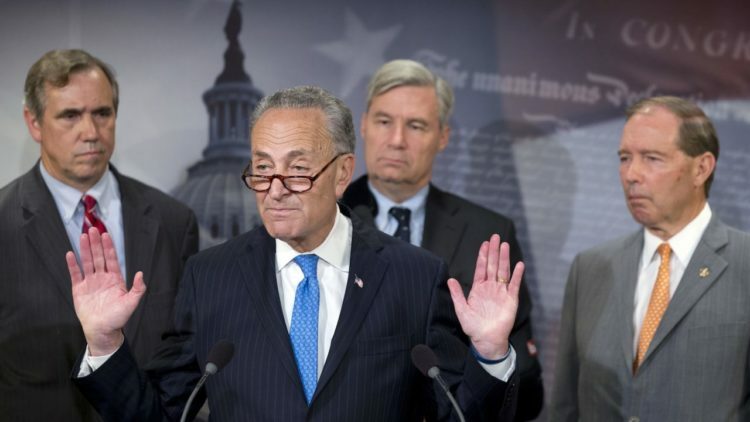 Led by ‘Chuck-you’ Schumer, the Dems are saying they will block attempts to pass the $1 trillion spending package next week submitted by Trump and the Republicans if it contains funding for the wall or pretty much any conservative agenda item. And they are cool with shutting down the federal government over it. Say it with me… obstructionists. And of course, they will blame it on the Republicans as they always do. When it happened under the Republicans, it was the end of the world. Under the Democrats, it’s a legitimate tactic. These guys have arrogance down to a science. I hope the Republicans are ready to dance with these morons. The nuclear option cometh and it should be used. Chuck Schumer is possibly the most evil politician among us today and that’s not an exaggeration. Now is when the Republicans show what they are made of and how far they are willing to go to fix this mess. Democrats said they will block any attempts to include President Trump’s proposed border wall – or other far-right agenda items – in the $1 trillion spending package expected to be announced this week. And, they said, they are not opposed to shutting down the government if Republicans insist on including it. 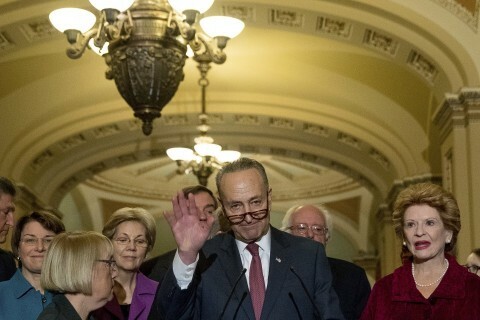 The warning letter, written by Senate Minority Leader Chuck Schumer and other top Senate Democrats, was addressed to Majority Leader Mitch McConnell. It warned against funding the U.S.-Mexico border wall and other “poison pills” that could be hidden in the budget plan — such as defunding Planned Parenthood, rolling back environmental regulations and allocating additional funding to the Pentagon. President Trump was absolutely right when it comes to hypocritical Democrats who have the shortest memories in history. Chuck Schumer’s letter to the Republicans said including any “poison pill riders” in the bill will have severe consequences. Here come the threats and the bullying. “We hope our Republican colleagues will work with us in a bipartisan way so that the appropriations process meets the needs of the American people,” Schumer said. “If Republicans insist on inserting poison pill riders such as defunding Planned Parenthood, building a border wall, or starting a deportation force, they will be shutting down the government and delivering a severe blow to our economy.” No sir… the Democrats will own this one and Americans will see that. The Democrats’ letter outlined concerns with funding what they called the “$25 million per mile” border wall, which, they say, has not been resolved by Congress or the Department of Homeland Security. “There is real concern that the Administration, put simply, has no plan to build the border wall,” the letter read, noting the lack of details the White House has provided in terms of design, eminent domain, location and construction. All of this is a lie. The Republicans need to fight tooth and nail for this. They need to stand their ground and use every weapon at their disposal. Let the Democrats know that there are consequences for threatening President Trump and the American people this way. In other words, do your jobs.